This poem first appeared in Red Berry Review. (Red Berry Press). Sidney Bending is a retired graphic artist living on Vancouver Island on the west coast of Canada. Her award-winning poetry and flash fiction have been published in Canada, the United States and Sweden. 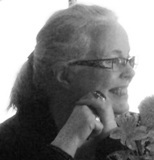 Sidney is a member of the Victoria Writer’s Society and the Heron’s Quill poetry group. Daily walks by the water inspire images for her poems. With a new digital camera (and membership in two photography clubs), she hopes to create a chapbook of photographs and poetry. Lovely the way the lines stretch out. The poem looks like a puddle, but not self-consciously so. Nice poem. What deft images swim in your few words. What power. Lovely, memorable. What a feat...tricking this reader's mind into so many ways of experiencing this poem. Reminiscent of red wheelbarrows. Lovely. Despite, and because of, its brevity, there are many ways to interpret each word and phrase of this poem. Like Tyler, I am reading it more than once and am opening my mind to a different meaning each time. Efficient and wondrous; worth of many reads! Watch the world, this poem tells us. Lovely. Shape counts. I knew Sidney had an eye for the shape of things before looking at her bio. Such balance! The middle line is balanced by itself and, combined with the other lines, balanced again. Good language too. 'spawn' is completely unexpected, yet just right.